Spring is almost here, and in a bid to get more organised, and while I'm decorating and waiting for the weather to warm up a little so I can get some gardening done I decided to try and sort some of my tools into a more orderly fashion. For some time I've had my small files amongst other things in old cups, which to be honest isn't the best way to keep them, especially when it comes to finding a specific thing, but I found a better solution on Pinterest of all places. 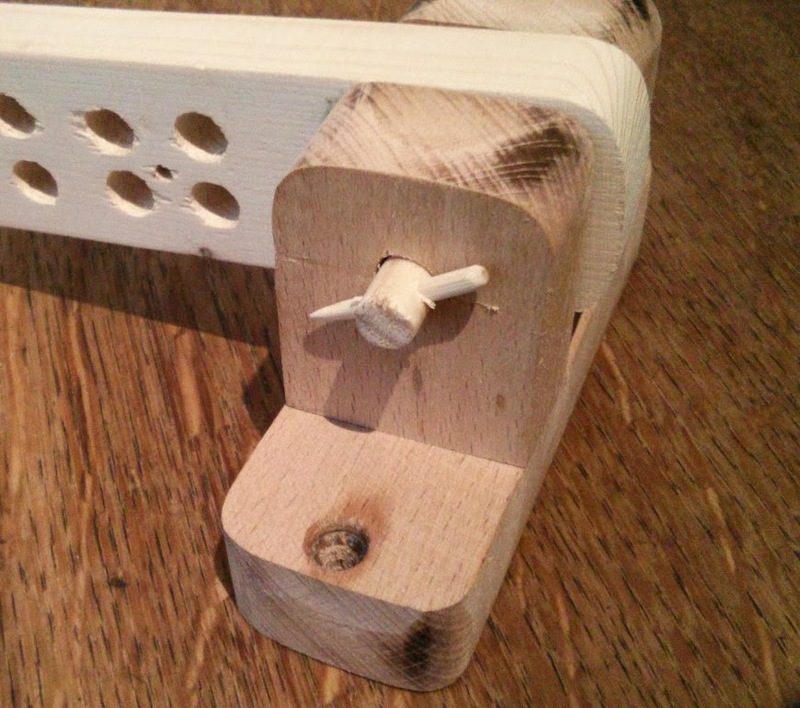 Made from scrap bits of wood. 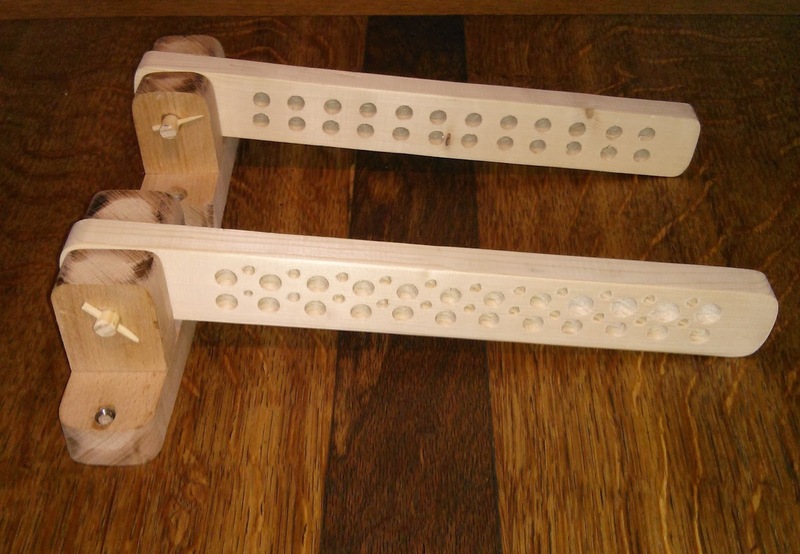 These are slightly different from the ones I saw on Pinterest, firstly the hinge is all wood, even the pivot, the others used a bolt, after having a quick look I couldn't find any that would do, so I just used a bit of 9mm dowel and put a couple of pegs in either end to stop it all falling apart, it's handy because I've been experimenting with wooden hinges of different designs, and these are kind of a prototype for another project I'm working on. Pictures a bit fuzzy, but you get the idea. 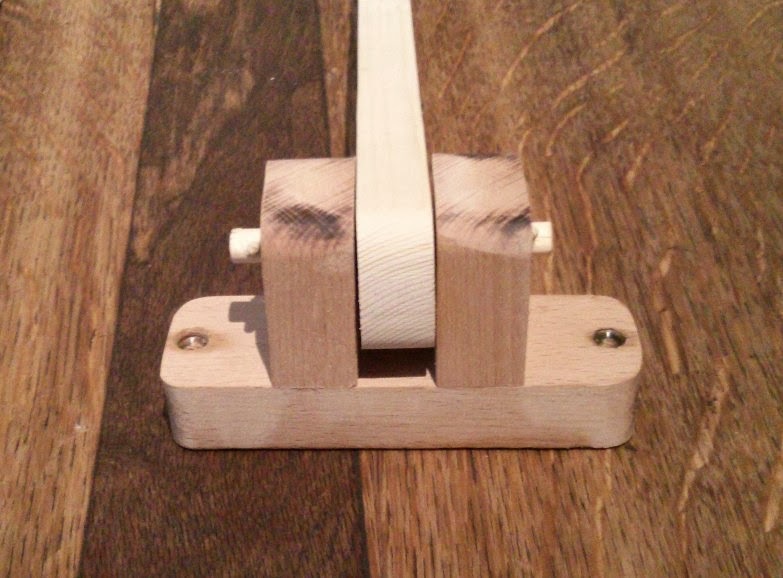 A simple hinge, using dowel and a peg. The other change I made is the holes for my various tools, as an example some of the small files I use from time to time don't have handles, and as such they would fall through some of the larger holes, and the same can be said for pencils and pens and other things, so I came up with a way to hold items of different sizes, using a piece of old inner tube. 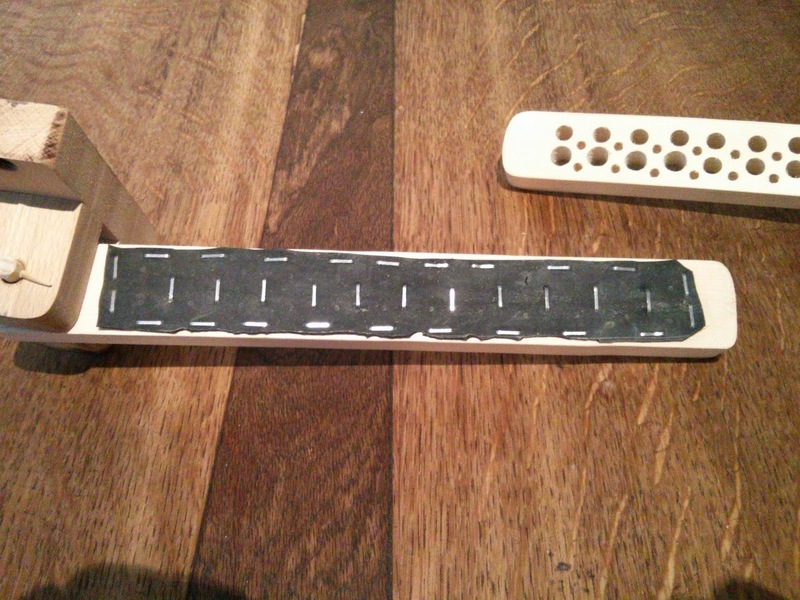 All I did was to drill a series of holes all the same size in one of the holders, and on the under side of it I stapled a bit of inner tube, then I just made a series of small holes in the inner tube that correspond to the holes in the wood. I could have made a neater job of it to be honest. The idea is that when I stick a pencil or pen (or other item) into the holder the inner tube grips it and stops it from falling through the holder, and because the inner tube is rubber it will stretch to different sizes meaning I can put different sized things into the holder with out having to worry about it falling out. 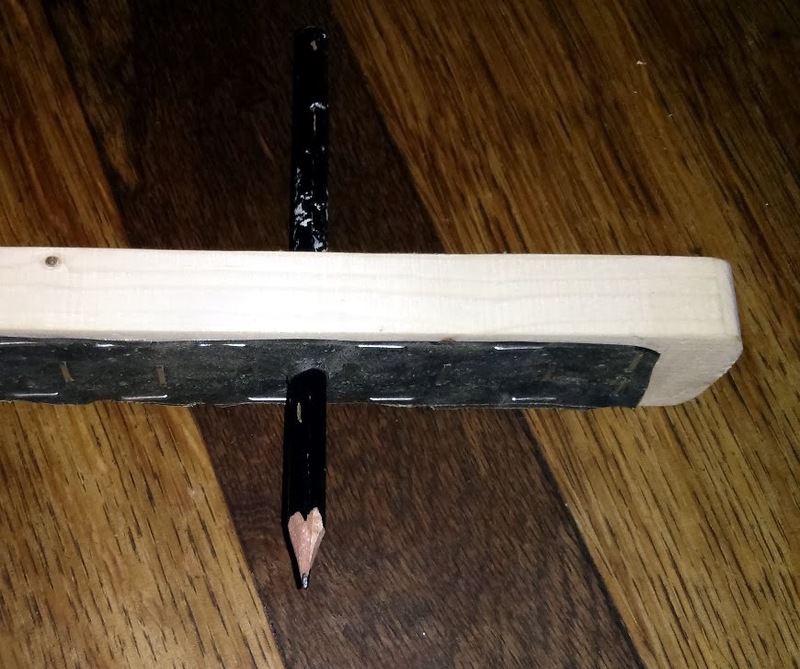 You can see where the inner tube has stretched around the pencil. 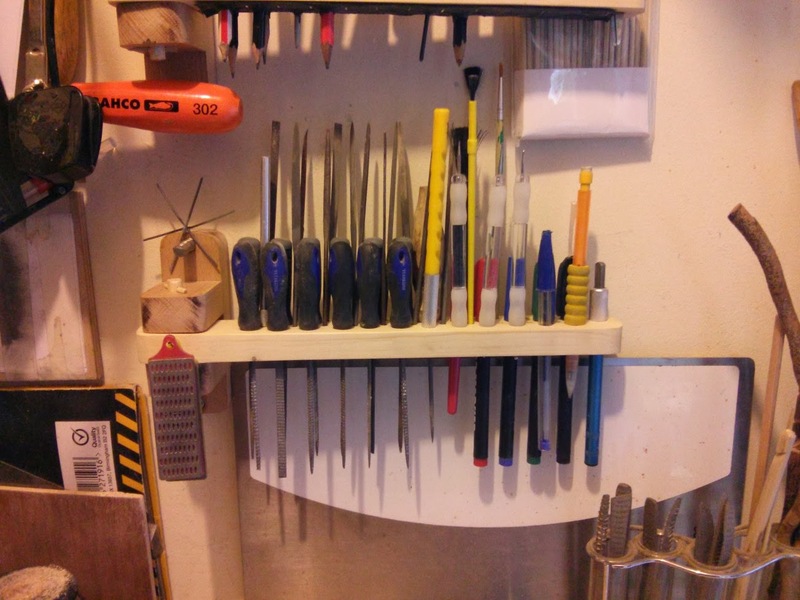 And that's about it, I now have more organised tools, and because the holders are hinged I can just move them around to get at the tools at the back, I'm also thinking of adding a small lamp to one of them so I can get better lighting when I'm doing small jobs, fixing them to the wall is easy enough, a couple of screws does the job. Makes for a more productive work space. Here's a quick look at a small wooden box I made that has wooden hinges on the lid, making the hinges out of wood allows for some creativity because lets face it sometimes hinges can be a bit boring, not that these are exciting, but as I said I'm still experimenting. Not much to say really, it's a box.